I wrote this book for you if you want to be able to locate your life in a single, encompassing story, one that includes everything from the first moment the universe began until yesterday, a narrative that embraces deepest personal meaning, a yearning to love and be loved, a quest for social justice and compassion. I wrote this book for you if you feel wounded by conventional religion, with its domineering God and not infrequent assaults on common sense, scientific method, and human dignity, or if you feel wounded by combative secularism and its not infrequent assaults on any real sense of purpose, transcendence, or belonging. I wrote this book for Jews who are seeking a way to integrate their admiration for Jewish values and ethics with a spirituality that cannot put on blinders and forget what their minds learned in science labs and history classes. I also wrote this book for non-Jews who are interested in what wisdom Judaism might contribute to their lives but cannot endure yet another system of counterintuitive faith and mandated obedience. And I wrote this book for all of us, beyond labels, seeking a way to celebrate the dynamism and unity of this marvelous, mysterious, awe-filled world. Finally, I wrote this book for myself, so I could continue to hold onto Torah as a way of life without abandoning or betraying my best values and the people I love most. Rabbi Artson begins the book….. I live in west Los Angeles in a home that was built in the 1950s. Our dining room has wood paneling along its four walls. When we first bought the house a decade ago, the room was painted a sickly green, presumably in the late ’70s during the high-water mark of the aesthetics of The Brady Bunch and The Partridge Family. The actual wood grain and tone were covered; I think in that era people thought such a look was cutting-edge. With that greenish coat of paint, the walls looked fake and cheap. When we finally got around to repainting the upstairs of the house, we asked our painter if he could just coat the paneling a simple white because the green was hideous. He pondered for a moment, then took his thumbnail and scratched on the paneling. The paint peeled away, and he said, “You know, I think that under this green there is actual wood.” His team spent three days sandblasting and varnishing. At the end of the week our dining room was transformed! The wood appears rich and the patterns in the grain are magnificent; it is now my favorite room in the house. I had thought, erroneously, that the wall itself was that sickly green when, in fact, that trashy look was just the coating that someone had painted over the shimmering wood. Modern Westerners often approach religion as I did the paneling: they assume that the only way to be religious is to accept the sickly green overlay of Greek philosophy. They take neo-Platonized Aristotelian scholastic presuppositions and filter religion through those ideas. Then, because they have insurmountable problems with those assertions, they assume that the quandary involves religion itself, or the Bible, or the Talmud, or observance, or God. 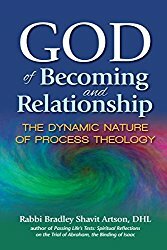 What Process Theology offers is the opportunity to sandblast the philosophical over lay of Hellenistic Greece and medieval Europe off the rich, burnished grain of Bible, Rabbinics, and Kabbalah so that we can savor the actual patterns in the living wood of religion, the etz hayyim, and appreciate Judaism for what it was intended to be and truly is. Much like what the sandblasting did for our perspective on our dining room, this book offers the tools to relate to the world anew: not as the bumping together of solid substances in absolute space and time, but as a world of shimmering particles of energy that interact constantly and eternally. Every creature is a resilient pattern of interlocking energy, each in a developing process of becoming. Because becoming is concrete and real, and being is only a logical abstraction, the distillation of becoming in pure thought, Process Thought focuses on becoming as the central mode of every creature, of all creation, and indeed of the Creator as well. The universe is recognized as a series of interacting, recurrent energy patterns, but not one that endlessly loops in the same repetitive patterns. Instead, the surprising miracle of our universe is that it seems to generate novelty with each new moment of continuing creation. New stars, new galaxies, and new elements combine and create new possibilities. At least once, a galaxy with sufficient stability and diversity produced at least one solar system with at least one planet on which the slow and gradual evolution of self-conscious life could – and did – emerge. In such a worldview, God is not outside the system as some unchanging, eternal abstraction. Rather, God permeates every aspect of becoming, indeed grounds all becoming by inviting us and every level of reality to fulfill our own optimal possibilities. The future remains open, through God’s lure, to our own decisions of how or what we will choose next. God, then, uses a persistent, persuasive power, working in each of us (and all creation at every level) to nudge us toward the best possible outcome. But God’s power is not coercive and not all-powerful. God cannot break the rules or unilaterally dictate our choices. Having created and then partnered with this particular cosmos, God is vulnerable to the choices that each of us makes freely as co-creators.